Live At The Moonlight Cafe on Dec. 8th. 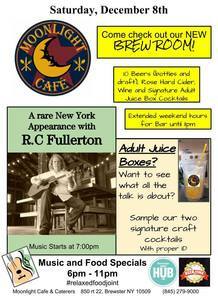 at 7 pm, Connecticut-based Robert Fullerton will be performing his original songs! In this rare New York appearance, his masterful guitar and vocals, coupled with the artistry of his lyrics will captivate you! Don't forget about our new BREW ROOM and our Signature house crafted cocktails served in our Adult Juice Boxes! We will have those and so much more! Don't miss all the fun.